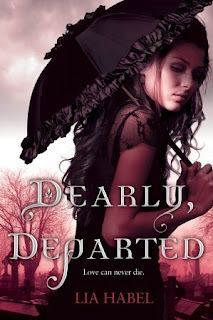 Title/Author: Dearly, Departed by Lia Habel. Husband's quote when he picked up this book for a minutes: "Is this about zombies? That's cool. But it has a chick on the cover so maybe it's like a Fabio book." Synopsis: The year is 2195. The place is New Victoria, a very human teenager living in high society, falls in love with Bram, a handsome and polite eighteen-year-old lieutenant who happens to be suffering from "the Laz," a disease that is slowly turning him into one of the walking dead. Bram is fully conscious and healthy enough to take on Nora, killer zombies, and the treacherous humans that plague his life - at least for now. But it is only a matter of time before the Laz will take him away from Nora forever. ~Product description. My Thoughts: This is an interesting, unique and well plotted book, but I felt that a lot of issues got in the way. However, since I read an ARC, the final product may be different. I like the beginning and the subtle world building that took place to give the reader a taste of this future society. I also like the dynamics between the characters. To me, it seems to be a very quiet beginning and it reminds me of an Austenesque type of tale, then the action starts and I feel *that* is really when the story started. The premise of the world and what is happening is intriguing. A society that is fashioned on Victorian England, but they have modern technology? Cool! It reminds me of the Steampunk World's Fair, with people walking around in their costumes and surfing the web on I-Phones. A zombie outbreak occurs and there are "good" zombies, thinking ones with memories and "bad" ones, that are violent and just want to eat your flesh. Chaos ensues, then political ramifications. It is ambitious in its scope and I commend the author for that. However, there are some aspects, some small, some large, that I felt could have been left out or changed. Admittedly on some issues I was very nitpicky, but certain details and plot elements stopped me in my tracks. Ultimately, it is the author's story and not mine and yes, it should be the way the author imagines it, but I couldn't always suspend my disbelief. My main issue is the chapters with Bram and Nora. It was hard for me to differentiate their voices from each other and sometimes I would have to go back to the beginning of the chapter to remind myself who the perspective was coming from. I also felt that these were the chapters I had the most difficulty getting through. However, I did like when Bram revealed his past and his story. It was very touching and I felt I got to see into his heart. Although they only knew each other a short time, they spent most it together, so their romance convinced me. It wasn't instantaneous but came about by each getting to know the other with butterflies bubbling up in their stomachs until they came to full boil. When I got to Pamela's perspective, the chapters flew by. Her story is fun and compelling. I love how she seems to understand what is going on when no one else does, how quick thinking she is and how she rose to the occasion. I kind of also liked Vespertine Mink, the rich society girl who is Pamela and Nora's nemesis. Although she isn't in the book a lot, when she is, she is no simpering damsel in distress. She also is quick witted and brave and kind of went against her stereotype and I enjoyed that. If she and Pamela feature in the upcoming books more, I may be swayed to read them. I do have to say that although I had issues with the novel, I feel that Habel accomplished a major undertaking and came up with an epic storyline. If you are a zombie or Steampunk aficianado, this book shouldn't be missed. 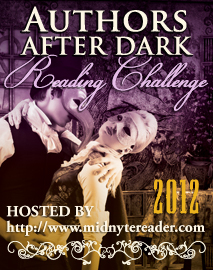 I must say, though, that I really hate when I can't tell different narrators apart. If there are dual narrators, they have to have distinct voices. Otherwise what's the point? Great review Pam. I enjoyed this book and would probably continue the series but I had issues with it also.